In the past week, we've launched two new pages on BloodHorse.com - the Community page and a completely redesigned Horse Health section. We've replaced the Blog Stable link in our main navigation with a link to the Community page. You can access all of the blogs from here, but if you still prefer the old Blog Stable index page, you can go to this page to see it. Also, any new blog post from the previous seven days can be found in the Blog Stable channel on the homepage, which normally appears underneath Today's Headlines. 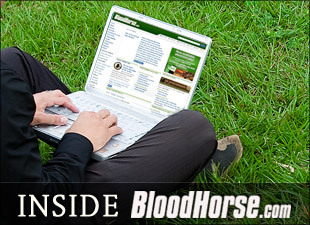 The Community page is a one-stop shop for BloodHorse.com blogs, polls, Facebook, Twitter, and other interactive features. Even if you're not a member of Twitter, you can use this page to follow the conversations that are going on in the Twitterverse. The Twitter application provides breaking news, the latest race results, and updates from the International racing scene. If you're one of the 20,000 visitors that visited our blog stable or voted in a poll last year, we think you're going to love the new BloodHorse.com Community. The BloodHorse.com Horse Health channel has a new look and the content has been greatly expanded. Articles, videos, the Horse Health Library, and the "Ask a Vet" feature will help keep your horses healthy and happy. More than 30 topics are covered in the Horse Health Library, ranging from Equine influenza to Ultrasonography in Horses. The new channel is powered by TheHorse.com and will continue to grow in the coming months. Finally, I wanted to touch on the Rachel Alexandra vs. Zenyatta Horse of the Year poll on BloodHorse.com. At last check, there were nearly 12,000 votes cast with Zenyatta holding a 51% to 49% lead. Zenyatta fans came roaring out of the gate and put Zenyatta way ahead in the early voting, but Rachel's fans aren't going to go down without a fight. Let me emphasize that these results are completely driven by the BloodHorse.com community, and there is nothing "fishy" about the results as some have suggested. Individuals are only allowed to vote once, and this is restricted by both IP address and a cookie on your computer. This one is going down to the wire and may be decided by a hanging chad (at last check, there were more than 400 votes cast from the state of Florida). The Poll closes at 11:59 pm EDT on 11/30/2009, so if you haven't already voted, be sure to do so prior to next Monday!